DC Universe has revealed when Young Justice: Outsiders will return, as well as set a premiere date for Swamp Thing. The streaming platform launched last September, with the announcement that DC’s upcoming slate of original programming would be exclusively available to subscribers. Titans was the first live-action show to air, with Doom Patrol close behind. DC Universe also revived beloved cartoon Young Justice for another season, titled Young Justice: Outsiders. Next up is Swamp Thing, but the service also has plenty more in store for viewers with both a live-action Stargirl show and an animated Harley Quinn series on the way as well. Young Justice ran for 2 seasons, beginning in 2010 and has maintained an incredibly passionate fanbase since its untimely cancellation. The series was given new life on DC Universe when the service picked it up for season 3, which began airing back in January. 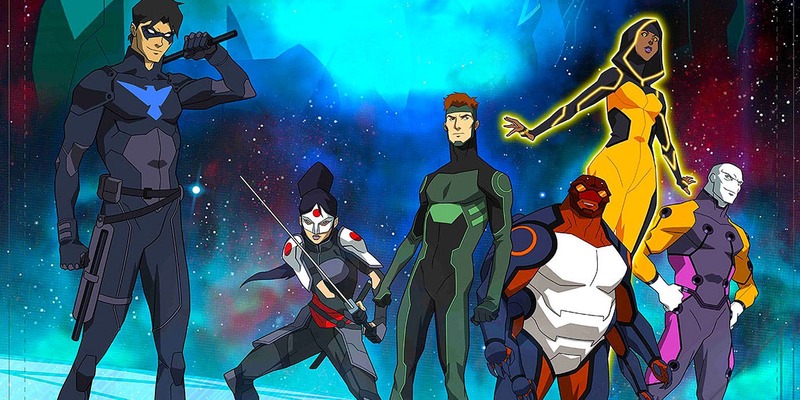 Young Justice: Outsiders took a break after 13 episodes and fans have been eagerly awaiting its return. Another one of DC’s most highly anticipated upcoming projects is its live-action Swamp Thing adaptation. The series will be produced by James Wan’s Atomic Monster, with Underworld helmer Len Wiseman directing the pilot. Much of the show will center on Abby Arcane, who will be portrayed by Teen Wolf actress Crystal Reed. In the comics, Abby is the close confidant and sometimes love interest of Alec Holland, aka Swamp Thing. DC Universe unveiled several new developments at WonderCon this year, some of the most exciting being a premiere date for Swamp Thing, as well as when Young Justice: Outsiders will return to wrap up season 3. The first episode of Swamp Thing will hit the streaming service on Friday May 31, and the remaining 13 episodes of Young Justice: Outsiders will begin airing on Tuesday July 2. Although many fans were hesitant to shell out more money for yet another streaming service, DC is certainly putting a great deal of effort into their slate of original programming. Titans was renewed for season 2 before the pilot even aired, indicating that DC was feeling very optimistic about the series. Although some viewers had misgivings about the darker tone of Titans, the show's popularity only increased as the season unfolded. Doom Patrol has been quite well-received, likely because DC chose to embrace all of the wonderful weirdness of that particular team. Young Justice: Outsiders was a big hit with viewers as well. There was worry that a Swamp Thing adaptation would be difficult to pull off and this may yet prove true. However, writer Gary Dauberman promised that the series will be dark, violent and mature-rated, even stating they were taking their cues from Alan Moore’s seminal run on the title. Aside from the fact that those behind-the-scenes will be taking the character very seriously, the way that DC successfully adapted a team as outlandish as Doom Patrol should ease the minds of at least some fans. With excitement for the series quickly mounting, Matt Ryan has even stated that he’s hoping to reprise his role as John Constantine, should the DC Universe series eventually choose include the character - which would make sense, since it was Moore’s run on Swamp Thing that introduced Constantine. With so many streaming services vying for viewers’ attention, DC Universe is certainly doing its best to separate itself from the pack. The sheer volume of original programming, especially considering the characters that DC has chosen to focus on, is undeniably awesome. As for Young Justice: Outsiders, it’s unclear if season 3 will be the end for the team or if DC will give the green light for the cartoon to continue. Fans won’t have to wait too long for Swamp Thing’s debut, but learning the fate of the animated series will likely require some patience. Swamp Thing season 1 premieres Friday May 31 on DC Universe. Young Justice: Outsiders returns Tuesday July 2 on DC Universe.